Kecskem�t is famous far and wide for the Kecskem�t apricot brandy, the colourful Art Nouveau buildings decorated with ceramics and the Kod�ly method of musical education. Fancy Palace, Kecskem�t The famous buildings around the wide, impressive Kossuth Square are: the tile-roofed Town Hall, the 600 year-old Franciscan church of St. Nicholas, and the Great Church. The Cifrapalota (Fancy Palace), ornamented with colourful floral patterns, is an outstanding example of Hungarian Art Nouveau architecture. Inside, the works of Hungarian painters of the 19th and 20th centuries are displayed. Students from all over the world come to the summer training courses of the "Zolt�n Kod�ly" Musical Education Institute, to study the musical education methodology of the Hungarian composer, in his native city. 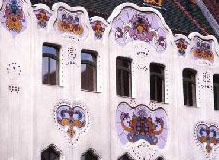 Many unique museums and nationally important collections have found a home here including: the Hungarian People's Applied Arts Museum, the Museum of Hungarian Naive Artists, The 'Sz�rakat�nusz' Toy Museum and Workshop, the only photography museum in the country, and the Leskowsky Collection of Musical Instruments. The tasting and guided tour of the Zwack Fruit Brandy Distillery is a memorable experience for all visitors.